Peace & Love Movement, Hard Times, Concrete Reservation, Inner City Blues, A Day In The Life and more. This show was 1st in the global classic rock chart, 4th in the global funk - soul - jazz chart, 5th in the global funk chart and 7th in the global hip hop chart. This mix was compiled and assembled by Sammy Needlz, Rok One, DJ Tahleim, and the film&apos;s director Shan Nicholson (all incredible selectors and musical encyclopedias in their own right). Much like New York City itself, it is divided into five sections (based on the musical genres that influenced these notorious gangs). From the anthemic soul and funk of the Black struggle, to the salsa and Boogaloo of the Latin Barrios, to the gritty and abrasive psychedelic rock of White gangland. 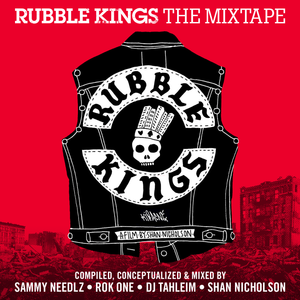 A true epic tale of war and peace, "Rubble Kings: The Mixtape" serves as a direct sonic glimpse into the heart and soul of this pivotal moment in the city&apos;s history. Bam Bam!- Pull Up~ Dat Selecta!!!! AMAZING! I love this, one of the best mixes I&apos;ve ever heard. Absolutely adored this mix man! Props! Phenomenal mix, brother - straight heat! Love the interludes! !